When Tess fled from her husband’s cruelty, her only desire was to live in peace. Then she found herself intrigued by the Santa Fe trail and the laughing eyes of the exotic Joaquin Morales. Their love was beyond imagining, yet Tess and Joaquin were pursued by demons not of their making. Only when they conquered the threats of the past could they embrace the paradise they found in each other’s arms. In her high bed, with its counterpane of white chenille, Tess Fallon burned. She thrashed and tossed, fighting the kindly slave who tended her wounds with a poultice made of some foreign herb. No, not foreign, Tess remembered. The plants were native here, only foreign to her. The slave, a woman named Marie, wrapped long lengths of cotton soaked in the mixture over Tess’s back and arm and breast. The fabric cooled her hot wounds. But one wound would not heal. The newly seeded babe in her belly was lost. Blessedly lost. Tess wished to bear no child to a man—even a native Irishman from her own village—who could horsewhip other human beings. Including his own wife when she dared to interfere. Water spilled on her lips. Tess thought to let it fall, but her mouth opened of its own accord to catch the liquid. Cool and sweet, drawn straight from the brook. It soothed her fever-parched throat. With a gasp, she breathed in, and drank again, deeply. Tess dropped back to the pillow and looked at Marie. The slave was impossibly round, as people never were in Ireland, with large breasts and a full face and ageless black skin, smooth as a stone in spite of her fifty-odd years. “How is Sonia?” Tess asked. Tess nodded. Relieved to hear the news that Sonia had survived, she fell into a slumber unmarred by Seamus McKenzie, or bullwhips, or hunger, or pain. When next she awoke, she began to plan. Tess gratefully jumped down from the wagon of the Spanish traders. “Are you coming, Sonia?” she asked. “There is no hurry,” said one of the wives of the traders, a woman with hair as black as coal. Her eyes were kind as she took Sonia’s arm. “Walk a little.” Over her shoulder, she said something in Spanish to her husband, a lean man with a thin mustache. Wearily, Tess headed over the grass toward the river. Her body ached, not only from the long, long journey from Independence, Missouri, down the Santa Fe trail to this flat, plain land. She ducked into a thick stand of cottonwood trees that would offer privacy. Tess tended to the needs of her body, then unable to resist the lure of cold, fresh water, she moved toward the bank of the river. She splashed her face, feeling grit sluice away. A sharp, long cry pierced the stillness. Tess froze, listening. There were all manner of beasts in this new place, not like in Ireland, where cows and dogs and cats gave the only music. Here she had seen bears and wolves and a small dog they called a coyote that was most frightening of all. It came again, a whooping, terrifying sound, as high and eerie as a banshee’s wail. That was no animal. Her mouth went dry. A shard of terror stabbed her, making her heart stop for a breathless second. She heard the horses, and an abbreviated scream, and more whoops, all undercut by the soft, soothing chuckle of the river behind her. She thought of Sonia, and scrambled to her feet. Oh, no. Not this. They had come through too much, come too far. Grabbing her skirts, she ran through the cover of the trees, staying low. Near a small scrubby bush, she knelt to look out. A swarm of black-haired savages, beautiful and terrifying at once, with their long limbs and paint, had already done their work. The trader’s wife lay on the ground, her head bloody, the black hair gone. Before Tess’s horrified eyes, the wagon master was stabbed viciously, and the Indian who did it gave forth a bloodcurdling cry. Tess looked for Sonia and saw her hiding behind a wagon wheel, in the shadows. For the moment, she seemed safe. An older Indian, with hair as long as Tess’s own and shining in the sun like the wings of some great bird, gave an order. The others circled toward him. Sonia crouched where she was, and Tess could see her rigid grip on the wagon wheel. Just then, one of the warriors rounded the wagon one more time. The instant he spied Sonia, she rolled backward, out of his reach, and broke for the trees where Tess hid. The Indian lifted his bow and fired cleanly. Tess screamed when the arrow pierced Sonia’s skirt. Sonia stumbled another three steps, then fell to her knees. The warrior swung down gracefully from his pony. Sun glinted on his knife. As long as she lived, Tess knew she would never forget the look of him, painted with bright color like the ancient warriors of her own land, who’d fought nearly naked like this, covered only in paint. She would never forget the cold way he moved toward Sonia, his knife upraised, his face as calm as if he were going to butcher a pig. His was the face of a soldier, accustomed to war and killing. But Tess had learned to fight herself. She thought of her body painted blue like her ancestors, and grabbed a thick branch from the ground. She bolted from her hiding place, making a high, wild sound of her own, wielding the huge stick in front of her. Before she reached him, the Indian had squatted by Sonia, grabbing her head roughly in one hand as he lifted his knife with the other. Tess swung her club, and it caught him on the shoulder, knocking his knife away. He scrambled for the weapon and sprang to his feet. Tess ran straight at him, swinging the club. He lunged at her, slicing the thick wool of her traveling costume as if it were bread. She lunged back, thrusting the branch out before her, and hit him in the chest. He grunted, then ducked her next swing, and gave a swipe with his knife that nearly slashed her face. A blind, red rage was upon her. She could hear only the race of her blood, the grunt of the warrior, and the harsh grate of her breath. To the death, she would fight him. She had come too far, had fought too hard, to give up now. Joaquín Morales was the first man to get to the edge of the mesa. It was nearly dusk of an October day. Bitter wind, the scourge of the high plains, swept the desolate scene below. He halted and held up his hand silently to signal the two men with him. All three paused at the edge of the bluff. Joaquín stared grimly. An overturned wagon had spilled bags of trade goods and camp supplies into the yellow grass nearby a stand of cottonwoods. The last rays of sunlight came over the Rockies to the west, shadowing ground churned by the feet of many horses. Bodies were strewn over a wide area. Even at a distance of a hundred yards, Joaquín could see two had been scalped. Arrows protruded from the bodies of the others. “Reckon it’s the Arapaho,” Raúl said. It wasn’t a question. He lifted his head and scanned the horizon, squinting against the light. “Damned Armijo.” The curse came from the third man, Roger St. John, late of the British army. Joaquín nodded. Armijo, governor of Nuevo Mexico, had been warned some weeks before to release kidnapped Indian captives. He had not even bothered with a reply. Now the Indians had taken their revenge. Turning his horse, Joaquín rode down a smooth slope on the bluff. The others followed. Up close, the scene was even grimmer. Five men and two women had been slaughtered, their belongings scattered like tumbleweeds over the prairie. Joaquín saw a pair of lace-edged pantaloons caught on a yucca, flapping in the hard wind like a flag. He kept alert for the sound of returning Arapaho, but heard only the silence of death. Raúl dismounted, nodding, and began to collect the scattered goods. “It’s bloody heartless,” St. John protested. St. John shrugged and dismounted. He picked up a blue dress and shook it out, then tossed it over his shoulder. Raúl shot Joaquín an amused glance, and Joaquín met it with a half-grin. St. John was learning quickly. What seemed heartless in civilization was often simply a matter of survival here. The three men were comancheros, tradesmen of the plains, carrying everything from fabric to food to various tribes on a circuitous route that covered hundreds of miles. They’d left Taos a month before on a permit that would expire in a few short days. Raúl, an escaped slave from Mississippi, had been riding with Joaquín for more than five years, and took pleasure in needling a former British officer with more spirit of adventure than good sense. They all needled one another—it was the way of men. But today there was no time. They had to make camp by dark. As the others gathered usable goods. Joaquín rode in a circle around the site of the ambush, uneasiness crawling on the back of his neck. He did not fear the Arapaho, for their mission was vengeance and had been accomplished, but he had a sense he’d missed something. He listened intently for any slight sound, moving slowly toward a grove of cottonwoods that shaded a long stretch of the Río Napestle. The Anglos had christened it the Arkansas, for reasons Joaquín had never bothered to decipher. They had a lust for naming things their way, these Americanos. They blushed to call the blessed mountains by their true name, too. They were invisible at this distance, but Joaquín thought of the way they rose in perfect voluptuous points, and smiled. Las Tetas de la Madre–The Breasts of the Mother. What else? To his left, a trio of magpies suddenly screeched and flapped their wings. Joaquín halted. He peered closely at the trees and scrub oak. It might only be a war with a squirrel, but he’d learned to investigate such cries. The smallest gasp reached his ears. At the same moment, he spied a scrap of blue fabric through the branches. Hand on his rifle, he dismounted cautiously and strode forward, calling out, “Who’s there?” in English, then in Spanish. No answer. The magpies screeched again. Joaquín shoved aside the brush, seeing now the broken twigs and scuffed dirt he should have noticed on his first pass. Joaquín cursed. He knelt, instinctively reaching out to touch the slave’s face, to see if she were feverish from the wound. The white woman shrunk back, keeping her arms around her slave. She made a quick, savage noise of warning. 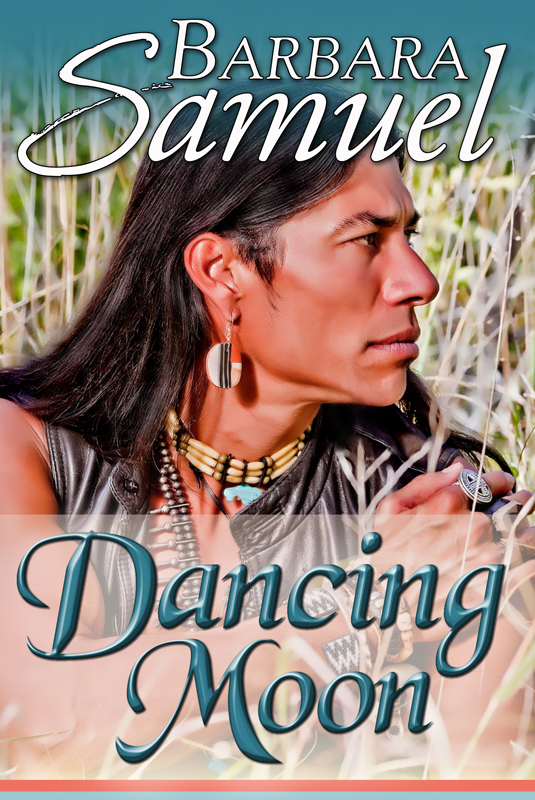 He realized how he must look to her with his serape and long black hair and moccasins. She stared at him as if he were Satan himself. “I won’t hurt you,” he repeated. To illustrate his good intentions, he put his rifle down and even lifted his serape to take the knife from his belt, which he put beside the gun on the ground. He held open his hands, palms up. Still she stared. He’d never seen such eyes—strange-colored, almost too big for her small face. Wild hair, the color of piñon nuts, tumbled in loose curls over her shoulders. Her jaw was hard, fierce. And she was protective about her slave. Perhaps she feared they would steal her. The woman stared at him a moment, then abruptly turned and murmured something in the slave’s ear. Gently, she shifted and tossed back the blanket that cloaked them. Joaquín sucked his teeth as the blood below was revealed. It stained both dresses in blotches. The Anglo apparently knew something of healing, for the wound on the dark woman’s thigh was packed with mud and herbs. She nodded, pulling the blanket around them again. Rocking back on his heels, Joaquín looked at her without speaking. The pair puzzled him. The white woman looked like a lady—the dress was well made and of a style he knew rich women wore. But he had not known many ladies to care so much about their slaves. “You must come with us,” he said. She made a wordless motion of protest, as if she wished to blend into the bark of the tree. The white woman stared at him. Again he noticed her eyes. Not quite gray. Not green. Somewhere between the two colors, like the shallowest edge of a hot-spring pool. She clasped her arms around her slave more tightly. In sudden decision, Joaquín stood and strode out of the hidden place. “St. John!” he shouted. Joaquín glanced over his shoulder. The woman still stared at him with distrust. It was a look he’d seen many times. Letting the branches go behind St. John, he went to join Raúl in the business of collecting usable trade goods. Tess watched the dark man depart, her hands trembling. She had never seen anyone like him, seemingly civilized in his speech, with the same lilt to his words as the Spanish traders who’d been killed. But not civilized, in his wild clothes, with the impossibly long, black hair, bound by red cloth at the nape of his neck. Not civilized, for he wore a blanket and leggings. Now a white man in the same strange clothes knelt next to her. At least he did not have the fierce dark features of an Indian, but blue eyes, red hair and a reassuringly crooked smile. Even his British voice was undaunting. Whatever evil the Brits brought upon Irish heads—and heaven knew it was a load—Tess had never seen them scalp anyone. “A few hours.” Tess closed her eyes at the remembered horror. “They came so fast,” she said. “Some other men fired guns at them.” She had been breathless with exhaustion by then, but the old Indian had called, and with swift grace, the warrior dropped his knife and rode off. “I hid from them. Sonia played dead.” Tess was still furious at herself for allowing these men to find her. Tess felt the pressure of lying all through her as she stared at the kindly face, but she would not deviate from her plan now. “Seamus McKenzie,” she said without blinking. Tess said nothing. She held Sonia close, taking comfort in her warmth. Below the blanket, she moved her hand on Sonia’s arm. A third man appeared, and Tess started, gripping Sonia closer. He was tall and black and had made no sound whatsoever as he came through the brush. Tess looked at his feet as if he might have floated. They were enormous, as were his hands. His sparse beard was grizzled with white, and in his narrowed eyes, Tess saw his hatred. Once, he too had been a slave. She would have gambled all the money in her hems on the assumption. For a long moment, Raúl stared at them with a flat expression. It would be amusing, him thinking her a great lady, Tess thought, but it was important that she maintain the ruse or she and Sonia would be in grave danger. If he were an escaped slave, he’d know as soon as he heard her speak that she was no plantation belle. She’d have to think of a lie to convince him if it came to that. Tess eased forward. The man’s big hands seemed surprisingly gentle as they slipped beneath Sonia’s legs and back. With a grunt—Sonia herself was no slight maid, but a strappingly tall woman with long muscles and a babe in her belly—he gathered her limp body and stood. Tess jumped to her feet to give him the blanket, but she’d been sitting so long in the same position, her legs nearly buckled. She hobbled toward Raúl and tossed the blanket over Sonia. Raúl gave her the same odd look as the first man had given, then abruptly turned and took his burden out of the hidden place. “No.” She rubbed her knees and took an experimental step. The tingling eased. Picking up her once-fine blue cloak, she threw it around her shoulders and followed after Raúl, anxious not to lose sight of Sonia.